Mummy drinks the fish water | What's a daddy for? Some stories just demand a happy ending. 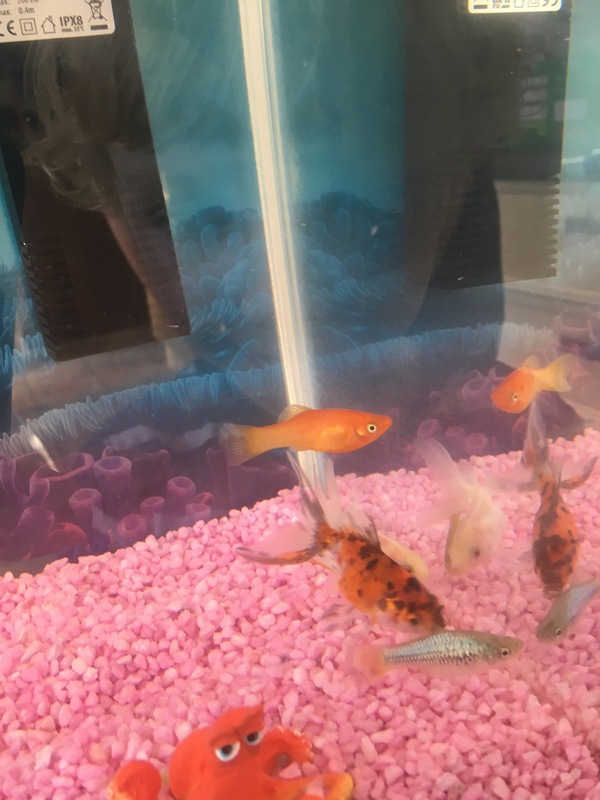 Ever since my original blog about my difficulties in buying a fish for my son (https://whatsadaddyfor.blog/2017/08/13/buying-a-fish-is-harder-than-having-a-baby/) the questions have just refused to go away. Those who read it, all seven of you, will recall that I had bought the tank, filter, food, conditioner, a toy octopus and pink stones. 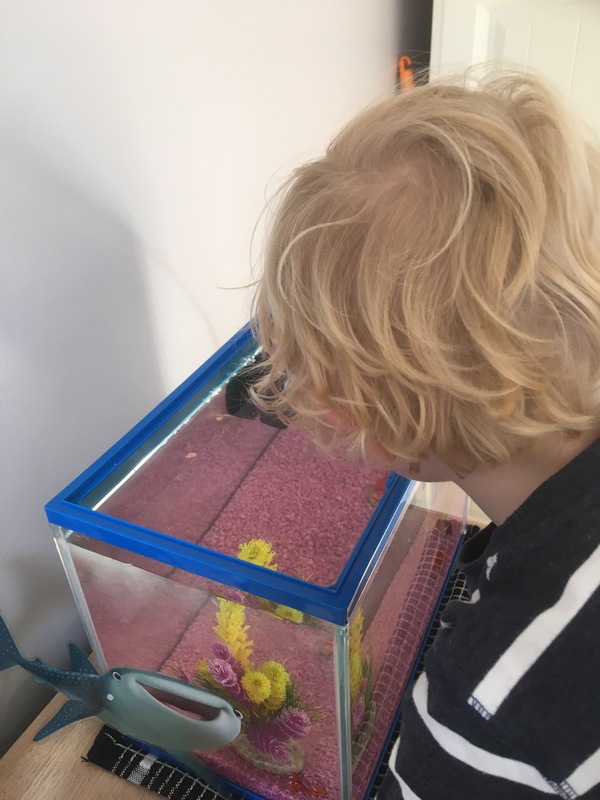 Before we could get our boy his first ever pet we had to have our water tested in the shop to ensure that it was a safe environment for living creatures. And now, the story continues. I’m happy to report that as of today, we have passed all the stringent tests. Now we have fish swimming happily. And it all went off without a hitch. I had been treating the water for a couple of weeks, pouring in copious amounts of expensive liquid from little plastic bottles into the tank. Some bio boost. Some water conditioner. Some more of each. Then the water turned cloudy. I wasn’t sure this was a good sign. I considered my options. I decided on adding some more conditioner. I don’t even use conditioner on my hair and here I was using dollops of it in an empty fish tank. I wasn’t even sure what it was supposed to do to the water. The water turned an even murkier colour, like a swamp. I watched a fly buzzing around the room. When it flew near to the fish tank it seemed to lose its bearings before colliding with a wall and dropping dead to the ground. I thought best to dispose of this rancid water. As I poured it down the sink it bubbled and hissed. The poor fish will never know what a lucky escape they had. I filled the tank afresh and decided on a new approach. I would read the instructions on the bottles this time. It turned out you only need to use a tiny amount, less than a capful. This was more promising. When we were satisfied that the water had been suitably filtered, conditioned and boosted, we took a sample and headed off to the pet shop. Now this part is worthy of some comment. There are usually plastic water bottles lying around our house. Both my wife and I drink a lot of water. It seemed logical to take a sample of the fish water in one of these bottles. Right? I was driving the car. Mummy was in the back playing a running joke with our son where she was telling him not to drink the fish water from the bottle. He laughed along. The first six or so times anyway. Then I heard a squeal from the back seat. The sort of noise which immediately makes you slam on the brakes. She was wiping her hand across her mouth in a sort of panic. There are some things which happen in life which just defy explanation. The only thing I can put it down to is muscle memory. Put a bottle of water in the hand of someone who drinks a lot of bottled water and they may well take a slug without thinking. Even when playing a game with your son which involves telling him not to drink the fish water. It’s just what your arm expects to do. I suppose I should just be thankful we hadn’t put it into a wine bottle. And so it was that my wife, the mother of my child, a respected and serious news journalist, drank the murky water that we were bringing to have tested for the fish. But it was worse. Having realised her mistake in the middle of the action, she then spat the remainder of the water back into the bottle. So now the water which I had carefully cultivated and nurtured as a safe environment for fish, had partially been through mummy’s digestive system. As I pulled into the carpark I wondered about how I was going to explain this to the man in the shop. And now another confession. We went to a different pet shop this time. I simply couldn’t bear any more lectures from fishman, who starred in my previous post. I wanted to talk to someone who could relate to humans, as well as marine animals. In this new shop we were assisted by a younger male who had what seemed to be a sea serpent tattooed on his arm. I took this to be a good sign. I like people who are committed to their profession. There was a nervous moment while he tested the water by dipping a stick of cardboard into it. Mummy was lurking in the background. She seemed to have turned a bit green. But he turned cheerily and told us the water was fine. Finally. Now, after a month, my son could do what we had all believed would be straightforward in the first place. Buy some fish. He selected five little lively ones. Ginger, Goldie, Larry, Harry and Matthew. They were duly chased, netted and bagged. In fact this shop was even happy to sell us goldfish, something which fishman had warned us was illegal. I said to hell with it and bought a couple. I like to live on the edge sometimes. A soldier of fortune. I felt like B.A. out of the A Team. Now the fish are happily ensconced, swimming around in our little tank. Our son is learning a little bit about responsibility, having taken on the job of feeding them. He’s happy. I’m happy. It’s a good ending. The only unanswered question is the long-term effects of drinking fish water. We await with interest to see if mummy grows gills.